I'm delighted to introduce Pumpkin Beth to you - she's a horticulturist and garden writer who's also holder of the National Collection of Miniature Phalaenopsis species. In this guest post she introduces her collection, offers up some tips on Phalaenopsis care and highlights some of the orchids in her collection. Find out more about Beth here and do explore her website which is full of fantastic articles, including a wonderfully detailed piece on how she set up an orchidarium. (Click on the smaller images below and you'll be able to view a larger version of the image). Do check out episode 65 of my podcast On The Ledge to learn more about Phalaenopsis. There is much more to the Phalaenopsis genus than the Phalaenopsis plants that you buy in your local supermarket. There are around 60 different wild Phalaenopsis species, from which all of the hybrid Phalaenopsis plants that we know and love descend from. These wild orchid species can be found growing in a range of locations including Myanmar, India, Java, Borneo, China, Thailand, Vietnam, the Himalayas, and the Philippines. 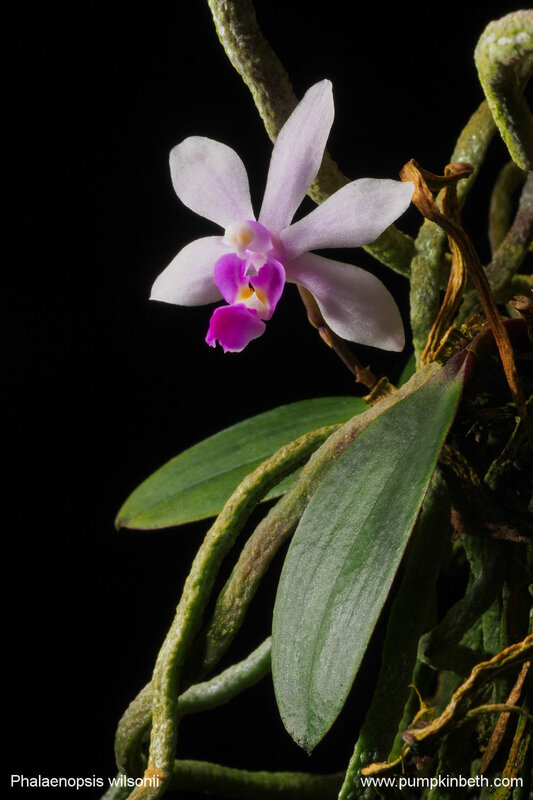 Sadly, like so many orchid species, the natural wild Phalaenopsis species are now rare due to over-collection, and habitat loss from logging, human expansion and destruction. Many of the wild Phalaenopsis species can be more challenging to grow, as they have adapted to the specific conditions found in each of their natural environments, whereas the modern hybrid Phalaenopsis cultivars that are found in orchid nurseries, supermarkets, and garden centres, are more resilient and forgiving, having been especially bred over many years to thrive in the conditions found inside our homes. These hybrid Phalaenopsis plants have been bred to flower frequently and for extended periods, even in a less than perfect environment. If you’re keen to purchase British grown plants and wish to support British nurseries, you can now purchase Phalaenopsis plants grown by British nursery Double H Nurseries, whose orchid plants are now available from many leading supermarkets. Most hybrid Phalaenopsis plants that are purchased from garden centres, supermarkets, or orchid nurseries are a great purchase! These plants flourish inside our homes on windowsills away from bright and direct sunlight - a bathroom windowsill in front of a frosted glass window is ideal, as the orchid’s leaves and flowers won’t be scorched by bright sunlight. Avoid growing Phalaenopsis plants above a radiator, as your plants won’t thank you if you grow them too close to a heat source and will decline. These Phalaenopsis hybrids can be in flower for many months at a time they don’t just bloom in spring like many of the wild forms; Phalaenopsis hybrids can flower repeatedly throughout the year, and in fact some plants can be in flower continuously for a year at a time. I have a keen interest in plant conservation, so I always knew that I wanted to establish at least one National Plant Collection. At home, I grow a wide range of houseplants and terrarium plants, which delight me every day! I became interested in terrariums when I was a child and my interest in this method of growing has never waned. I trial both terrarium plants and terrariums, and I include the results of many of my trials on my website pumpkinbeth.com. I decided to create a National Collection of Miniature Phalaenopsis species, as I have a great love of the Phalaenopsis genus and I was aware that many of the natural Phalaenopsis species were becoming more scarce in their natural environments. I hoped that by showing my readers the natural species of the Phalaenopsis hybrids they know so well, I could cultivate a deeper love of wild plants and highlight and raise awareness of the threats that we ourselves have become to many wild plants and special environments. I had the aim of cultivating a deeper love and protection for these wild plants and their growing environments. I hope to help my readers to grow all of their houseplants in the best conditions, so they can have the best chance of success and can avoid the mistakes that I have made myself – as I show my own mistakes in detail. I hope to help my readers to find the best plants for their set up, whatever indoor space they have. Phalaenopsis parishii is a miniature epiphytic orchid species, which was named after Samuel Bonsall Parish, a Californian botanist, who established a large collection of plants from Myanmar. In this miniature orchid’s native environment - in Myanmar, India, Thailand, Vietnam, and the Eastern Himalayas - P. parishii grows at up to 500m above sea level, where this quite charming little orchid can be found growing upon moss-laden trees, on branches that cascade over streams, and rivers, or on trees growing in areas near water. In the wild, P. parishii is a deciduous orchid, although cultivated plants usually retain their leaves throughout the year. So, if your plant loses all of its leaves, hope isn’t lost – your plant may recover! P. parishii thrives in a very humid environment, where the plant will enjoy warm to hot temperatures and receive indirect, bright, filtered light. P. parishii produces scented flowers, but this fragrance only develops if the plant’s ideal growing conditions are experienced and if the temperatures are sufficiently warm enough while the flowers are developing, and whilst the plants are in bloom. None of my P. parishii plants have ever been fragrant. Phalaenopsis lobbii is a miniature epiphytic orchid species, which was named in honour of Thomas Lobb, a British botanist and Victorian plant collector. P. lobbii can be found growing in India, Bhutan, Vietnam, Myanmar, and the Eastern Himalayas and is a fraction larger than P. parishii. Phalaenopsis lobbii f. flavilabia is the yellow form of Phalaenopsis lobbii. This miniature orchid produces really cute flowers in a very pretty, pastel yellow colour. Phalaenopsis honghenensis is a species of epiphytic orchid that originates from Yunnan in China, where it grows at 2000m above sea level. It produces attractive flowers that vary in colour from pink to green, with many plants producing flowers that display both of these colours. One of the most exciting things about this plant is that its blooms have a complex scent which has a very similar character to smokey bacon! I have found that Phalaenopsis malipoensis is prone to aborting its flower buds, this orchid species takes a long time to develop and produce its flowers, so if your plants are in bud, you may have a while to wait until your plant is in bloom. Phalaenopsis wilsonii is named after Ernest Henry Wilson, an English plant hunter and collector, who collected and introduced a vast number of plants from East Asia. P. wilsonii is a miniature to small sized epiphytic orchid species, which can look a little worse for wear, as it’s rare to see a specimen with as many as four leaves. The plant’s long and flattened roots can grow in a congested tangle, while the pink tone and colour of this orchid species flowers can vary from plant to plant. Phalaenopsis wilsonii hails from China, Myanmar, and Vietnam, where it can be found growing at elevations of 800 to 2000m. 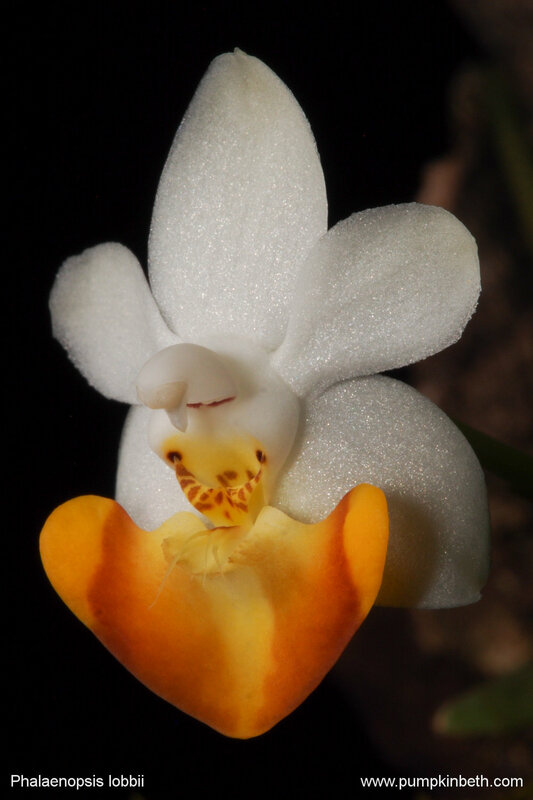 This orchid species grows as an epiphyte on trees, and as a lithophyte on rocks in damp, humid forests; the wild plants usually lose all of their leaves to help them to survive the low temperatures experienced during the winter months. This plant is threatened in its native environment due to over-collection and human expansion. 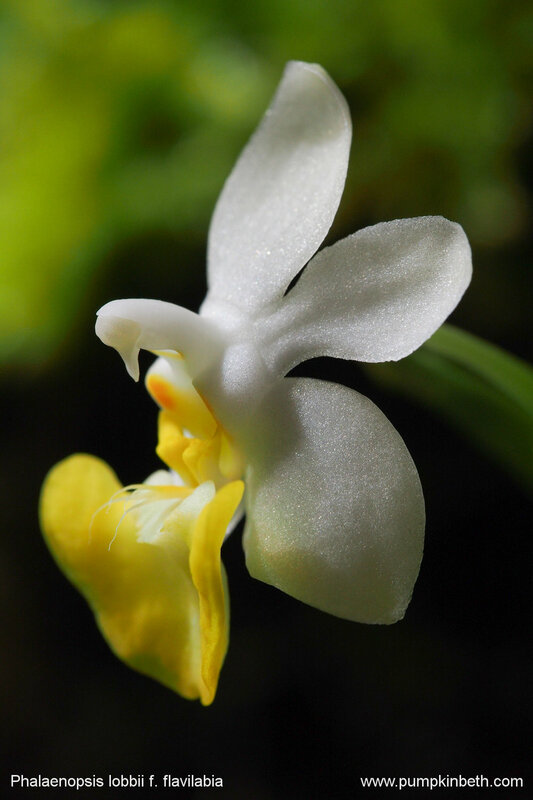 Phalaenopsis equestris is a small sized epiphyte, which originates from the Philippines and Taiwan. This orchid is used widely in plant breeding, many of the striped forms of Phalaenopsis that are offered for sale have Phalaenopsis equestris in their parentage. Phalaenopsis equestris is a very floriferous orchid species, large specimens can produce a fabulous display with a great many flowers held on each flowering stem. If you grow this orchid species, don’t be too hasty to remove your plant’s flowering stems after the first flush of flowers has faded, as often these stems will go on to flower again. I only remove flowering stems that have faded and turned brown. Phalaenopsis equestris ‘Aparri’ is a particular form of Phalaenopsis equestris that originates from the Municipality of Aparri, in the Philippines. Phalaenopsis cornu-cervi is an epiphytic orchid species, which originates from North-East India, the Nicobar Islands, Java, Sumatra, and Borneo. This orchid’s species name was given as the plant’s flowers look like a deer horn. Phalaenopsis cornu-cervi has a tendency to form large colonies of plants, all growing together on the same tree. It has a long flowering period, this plant produces its flowers one after the other, in succession along the length of the plant’s long flowering stems. Phalaenopsis cornu-cervi produces very variable seedlings, with many different coloured flowers being produced by this species, some plants are red in colour, others are green, some flowers have markings, others have none. The plant you see here is known as Phalaenopsis cornu-cervi ‘Green’. Phalaenopsis micholitzii is an epiphytic orchid species was named after Wilhelm Micholitz, an orchid collector and famous plant hunter. P. micholitzii produces large, waxy looking flowers, which are held protectively close to the plant, under or next to the orchid’s leaves, on very short stems. 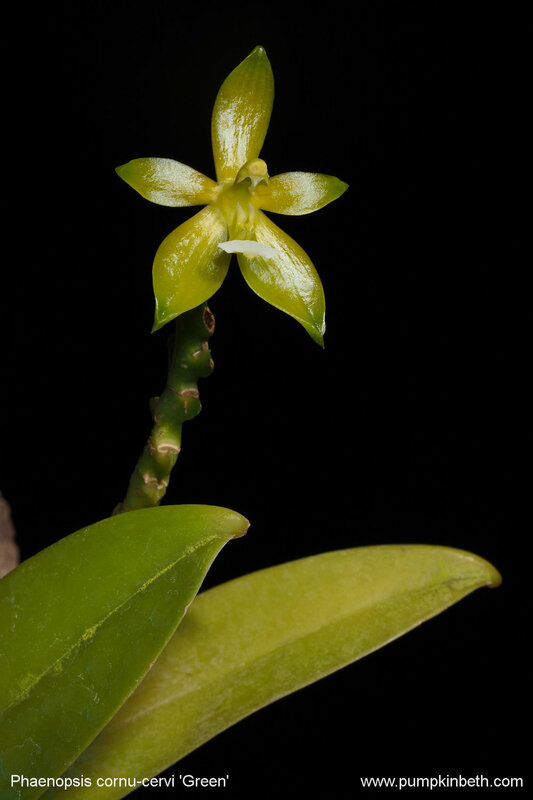 This species can be slow-growing, particularly if the plant’s ideal conditions are not present, when this orchid can appear to be almost frozen in time.